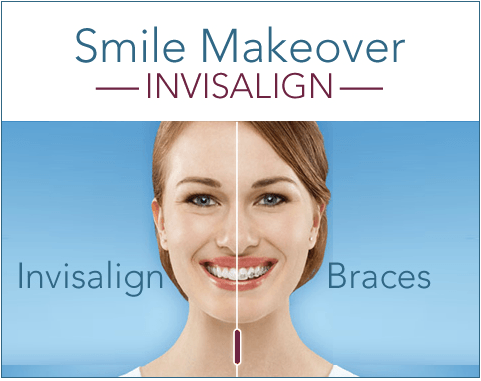 Invisalign is the premier orthodontic alternative for a happier, healthier smile. How does it work? After your free InvisAlign consultation with Dr. Cheng or Dr. Thorburn, an impression of your mouth will be taken. Within two weeks your clear aligners will be delivered and you can begin down the path to the smile you always dreamed of. With new technology, the InvisAlign system can achieve results up to 50% faster than previous options. Every 4-6 weeks you will return for a check-up with your doctor. After treatment is complete a custom retainer will be delivered to help protect your investment and your smile. Every Invisalign patient gets a free esthetic appointment at the end of InvisAlign treatment to guarantee you're happy with your smile. Don't want an uncomfortable wire retainer to wear each night? We offer multiple retainer alternatives to every patient. Below you will find examples of the types of cases Invisalign can correct. Click on the picture that most resembles your smile to see more in depth information about how Invisalign can help you achieve the smile you always wanted. Invisalign, an orthodontic treatment approved by the FDA, is the virtually invisible method to straighten your teeth without conventional metal braces. With Invisalign, a custom-molded set of transparent, removable aligners will progressively reposition your teeth. You can simply remove the aligners before eating, brushing, flossing, or special occasions. This technology is more comfortable and convenient than traditional braces. Patients do not experience the mouth abrasions caused by metal and wires, and Invisalign aligners are easy to clean. Adjustment appointments aren’t necessary, either. How does Invisalign work? First, we use 3D computer imaging to design a comprehensive treatment plan. This allows you to preview the final positioning of your teeth before you start treatment. Yes, you will see your future smile before treatment begins. Then a lab will create a series of aligners to reposition your teeth over one to two years. You’ll change aligners every two weeks until your smile is straight and beautiful. Typically, you will visit us every six weeks for progress reports. Wednesday 7:00 a.m. to 5:00 p.m.
Thursday 7:00 a.m. to 5:00 p.m.
Friday 7:00 a.m. to 5:00 p.m.